Hedge Funds Are Dumping HCP, Inc. (HCP): Do They Know Something You Don’t? HCP, Inc. (NYSE:HCP) has experienced a decrease in hedge fund sentiment recently. 14 hedge funds that we track were long the stock on September 30. There were 16 hedge funds in our database with HCP positions at the end of the previous quarter. The level and the change in hedge fund popularity aren’t the only variables you need to analyze to decipher hedge funds’ perspectives. A stock may witness a boost in popularity but it may still be less popular than similarly priced stocks. That’s why at the end of this article we will examine companies such as Molson Coors Brewing Company (NYSE:TAP), Ingersoll-Rand PLC (NYSE:IR), and American Airlines Group Inc (NASDAQ:AAL) to gather more data points. How are hedge funds trading HCP, Inc. (NYSE:HCP)? At the end of the third quarter, a total of 14 of the hedge funds tracked by Insider Monkey were long this stock, a 13% dip from one quarter earlier as hedge fund ownership slides again. 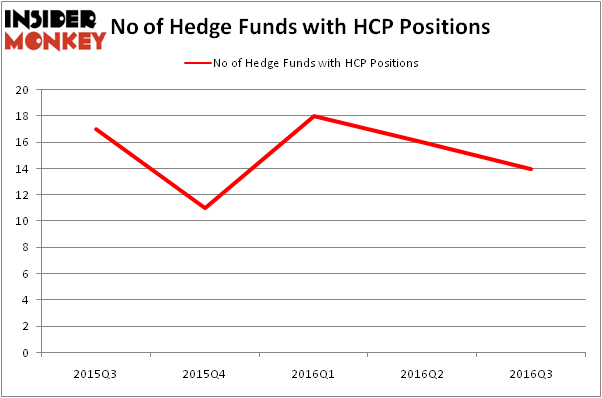 The graph below displays the number of hedge funds with bullish position in HCP over the last 5 quarters. So, let’s review which hedge funds were among the top holders of the stock and which hedge funds were making big moves. According to Insider Monkey’s hedge fund database, Jim Simons’ Renaissance Technologies has the number one position in HCP, Inc. (NYSE:HCP), worth close to $52.3 million. Sitting at the No. 2 spot is Adage Capital Management, led by Phill Gross and Robert Atchinson, which holds a $25.4 million position. Other members of the smart money with similar optimism contain Glenn Russell Dubin’s Highbridge Capital Management, Cliff Asness’ AQR Capital Management, and Matthew Hulsizer’s PEAK6 Capital Management. We should note that none of these hedge funds are among our list of the 100 best performing hedge funds which is based on the performance of their 13F long positions in non-microcap stocks. Hedge Fund Interest in Companhia de Saneamento Basico (ADR) (SBS) Flatlines Boston Beer Company Inc (SAM): Hedge Funds Finally See Something to Like Again... Should You Follow the Smart Money Into Ritchie Bros. Auctioneers (USA) (RBA... Hedge Funds Are Pouring Into Sodastream International Ltd (SODA) Hedge Funds Are Growing More Bullish on Regional Management Corp (RM) Is Rexnord Corp (RXN) A Good Stock To Buy?